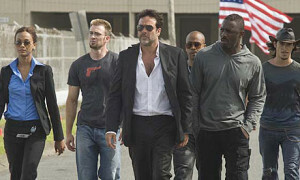 A disappointing, cliched film about a bunch of rogue thieves who are setup and double crossed by the man who hired them. The Losers is a movie about a team of specialists who pull off armed heists. That’s something that we’ve seen about a hundred times before. Most recently, I would say in the A team, which came out just a few months after this movie. the idea here is that this movie is based on a DC comic book and that it’s told in a very campy, comic art kind of guy. So what? I’m trying to figure out how and why this movie got made when it is so completely unoriginal, and I’m not sure that there’s an easy answer to that. The cast clearly got involved because it was a chance to participate in something that would be fun to make. Big action, big weapons and explosions. All of that. And the director is some no name who got thrown a lucky break with this. But creatively, it really has nothing going for it at all. The plot has our heroes out in the field as mercenaries on a jungle mission in a foreign country. They’re supposed to bomb a home, but then they see kids inside and call it off. Their orders are to carry it out anyway, but they refuse and that gets them into trouble with their boss. This whole idea about the stopping because they see kids is a giant cliche. From The replacement killers to the bourne identity to a thousand other movies, it seems to always be the same reason that stops our cold blooded assassins from pulling off a job. The truth is, if they were really so great at their jobs, they would know to pull it off anyway, despite the kids, because the only way to be the best is to put the job ahead of everything else. But this movie doesn’t want to think about possibly upsetting anyone. And so it doesn’t even have a single one of the guys object to them not going through with the job. It could have made for a fun debate with most of the guys saying, “are you crazy? those are little kids in there.” But nobody objects, and so the movie falls right into the usual cliched story patterns. The characters are perceived as dead and they come back to the united states to go after the guy who tried to kill them. He’s a man who none of them have seen, but only heard his voice over a phone, a man named max who is meant to be very mysterious. He’s played by jason patrick, and thankfully the movie doesn’t play him as a serious evil guy, but instead plays him as a crazy who does whatever he wants and constantly gets laughs. Jason Patrick’s villain is actually the best thing about this movie. He plays it right along the lines of some of the other great lunatic villains out for laughs, like gary oldman in the professional or christopher walken in the rundown. These aren’t great villains or anything, but they’re certainly funny. The movie has a lot of double crosses and computerized action scenes. none of the action is anything special. I had a lot more fun watching the a team than i did with this movie. Maybe that has to do with the director. The A team was directed by joe carnahan. He’s an action director, but he needed to warm up with his first few movies as practice before he really figured out how to film action. First he made narc and then smoking aces. Neither one was great and the a team is better than both of them. well, for the guy who directed the losers, it’s his very first action movie. All he’s got in the ways of big movies is the film stomp the yard, which i haven’t seen, but i believe is about hip hop dancing and music. Great credentials. The moves taken by the characters in the losers, pulling off one job after another, stealing from the big boss to get his attention, are all things that we’ve seen in other movies and that we’ve seen done a lot better. the italian job remake by f. gary gray is an example that comes to mind. there’s a scene in the losers where an armored truck is robbed in broad daylight in a busy street by a helicopter carrying an electromagnet, and the it just reminds me of how much better the daytime vehicle robbery ideas were in the italian job than in this movie. The only reason i had an interest in this movie was because of the cast, and the fact that it’s taken me this long in the review to talk about the cast should tell you how insignificant they are here. Yes, on paper it looked like there were good people in this movie. i happen to love idris elba from the wire. And he was great in his last heist-team movie, rock n rolla. But here he’s just another pawn with nothing to do. The same for everyone else, from jeffrey dean morgan to zoe saldana. chris evans is in there for comic relief, which is really what he does for every movie he’s in, but like will smith, his humor is so mainstream oriented that it’s not really that funny. here, he’s the womanizer. Same role he played as johny storm in the fantastic four movies. It’s just one more thing this movie does that we’ve seen before, in this case, even by the same actor. By the end, there are twists, although none is anything the smart. And they’re not even explained that well. this movie has no time for conversations and for what might actually be thought provoking debate. It has an agenda to get to the action scenes, and that’s really all it cares about. An action movie doesn’t have to be smart, but it has to be creative. At least a little. Wanted is a good example, because it’s not a great movie, but at least it tried to do something a little different. 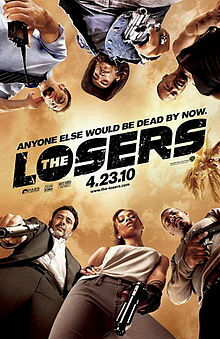 the losers is a carbon copy of every movie that came before it. It really doesn’t have anything new to offer at all, and while not painful to watch or anything, it really is a waste in the end. thank god for jason patrick’s villain in this movie, because he is probably about the only reason to watch it.